But the very best part of his story was his telling me someone brought a complete health machine to the island several months ago. “It cost me a few hundred dollars but I took the test,” he told me in his thick Italian accent which was a little difficult to understand. “I am 75 but the machine say I was 61. I’m younger than I am.” He flexed his arms and pulled his shoulders back as he made that last statement. “Most of my friends my age on the island are old. They sit around and drink, and play cards, and watch T.V. Plus, they’re fat — most of them.” That is when he made the statement that caused me to admire him the most. 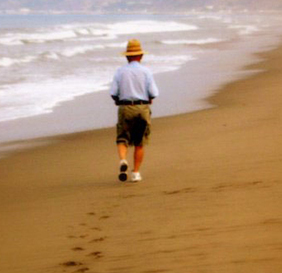 That is when he said, “I want to be active when I die.” He then smiled, and trotted off down the beach, waving with one hand, without even glancing back. He probably doesn’t know medically why he can say “I’m younger than I am” but he is doing most of what Prescription For Life is all about. Read it and see for yourself.